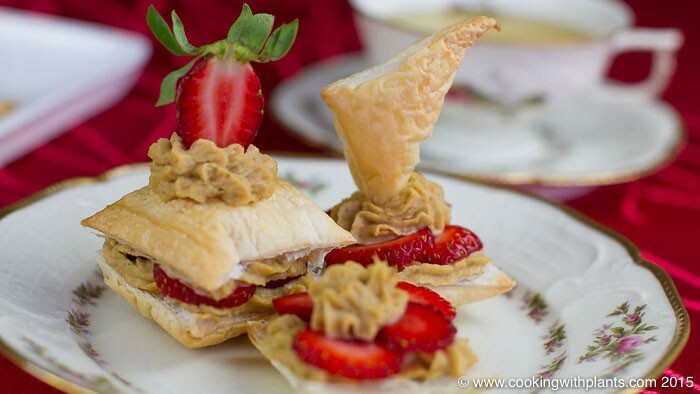 Looking for a vegan high tea recipe your friends will love? Look no further than these Strawberry Cheesecake Puffs! They have a rich flavor, and delicious balance of crunch from the pastry and creaminess from the cheesecake mix. Your non vegan friends will never know they have been veganated! Firstly, get your oven on to 180C/360F. For this recipe you will need a food processor, 1 to 2 lined baking trays and a piping bag. Place your puff pastry sheets on a chopping board and with plastic backing intact, score the pastry into 16 squares. Next, score 8 of those squares diagonally to make a total of 8 squares & 16 triangles. (See video if confused). Place all the puff pastry squares/triangles onto a baking sheet leaving enough room for each piece to expand. Place the tray(s) in the oven for approximately 15 minutes until golden brown. While the pastry is cooking put the rest of the ingredients (except the strawberries) into your food processor and blend till smooth. If concerned about flavor, add the miso, sugar and salt gradually. Take the blended mixture and put it into your piping bag. If you do not have a piping bag you can always use a plastic bag with the bottom corner cut off. Once the puff pastry is cooked allow it to cool in the tray. Take slices of pastry and pipe the cheese cake layer over the top. Add a layer of strawberries and repeat. Watch the video if you want a few ideas. Serve with your favorite tea, some good friends and relaxing afternoon. Some Miso pastes have a strong flavor. You might want to try adding your Miso gradually till it matches your taste preference. Such a treat!!!! It looks amazing and I am sure, just delicious! what brand is your yellow miso? I always change brands. Depends where I shop.